In addition to being as a major milestone in the history of astronomy and the study of Deep Sky Objects. One of these objects is known as Messier 10 (aka. NGC 6254), a globular cluster that is located in the equatorial constellation of Ophiuchus. 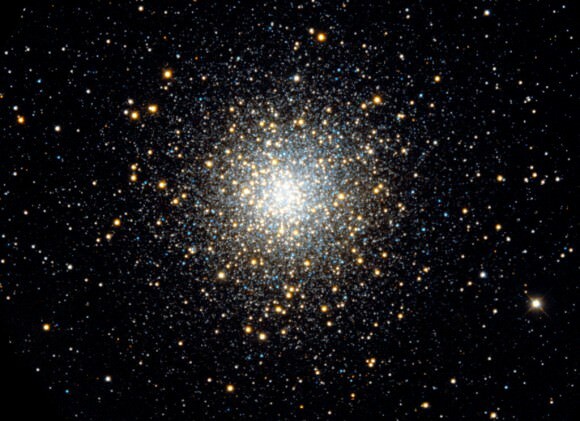 Of the many globular clusters that appear in this constellation (seven of which were cataloged by Messier himself) M10 is the brightest, and can be spotted with little more than a pair of binoculars. The M10 cluster is one of the closer objects to the center of our galaxy, located just 5 kiloparsecs (16,000 light years) from the Galactic Center, and about 14,000 light years from Earth. Measuring some 83 light-years in diameter, this cluster has diffuse edges that reach beyond its much-brighter core, which measures roughly 35 light-years across. On average, the cluster is very bright, with a visual magnitude of 6.6. The core region is home to many binary stars, which tend to migrate towards the core due to their greater mass. Binary stars are estimated to make of 14% of the core region of the cluster, while making up just 1.5% of the outlying regions. Similarly, the core region contains a concentration of interaction-formed blue straggler stars – a type of main sequence star common to clusters that are particularly bright – as well as four variable stars. In terms of the abundance of elements other than hydrogen and helium, Messier 10 is moderately metal–poor. The abundance of iron, is only 3.5% of the abundance found at the surface of the Sun. In addition, it also appears in close proximity to another object in Ophiuchus, the globular cluster M12. Although they seem to be close together and close in size, the M10/M12 pair are actually separated by some 2,000 light-years. M10 is a also a much more concentrated globular showing a brighter core region to even the most modest of instruments. This compression of stars is what classifies one type of globular cluster from another, and M10 appears brighter, not because of this compression, but because it is about 2,000 light-years closer. Using binoculars, M10 is a same-field binocular pair with globular cluster M12, which is located about half the width of a fist west of Beta Ophiuchi. M10 is the southernmost of this pair and will appear brighter in the night sky. To help orient yourself to the correct area, identify Beta Scorpii as your first starhop marker. Slightly more than a fist-width north, you will see the twin “Yed” stars (Delta and Epsilon, traditionally known as Yed Prior and Yed Posterior). To the northeast are another close, bright pairing – Beta and Gamma Ophiuchi. M10 and M12 are about 1/3 the distance between the twin Yeds and the Beta/Gamma pair. Both are bright enough to be seen as a small, fuzzy patch in the finderscope. Whether you resolve it or not – the beauty is finding it! Thank You on this fascinating series. 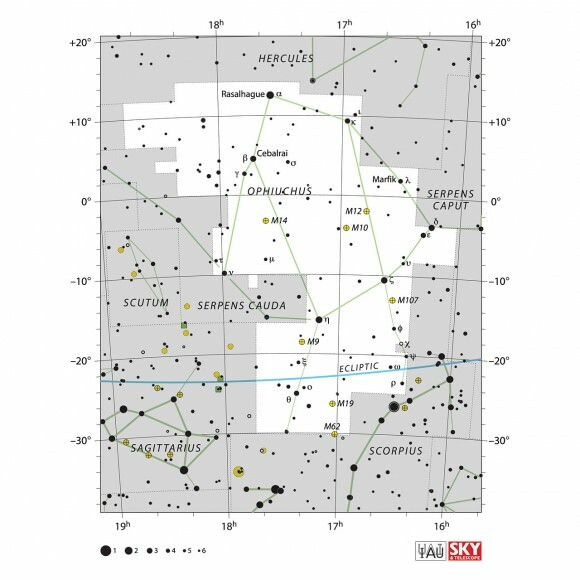 As I find more targets for my telescope, my mind wanders to what those early astronomers were thinking about when they seen some of these stars for the first time. I use to dream of becoming an Astronomer but didn’t. Fascinating no matter how you look at it. As a child, the night sky appeared awesome to me. Still does.